Freeland was the moniker that architecture and urbanism practice MVRDV first gave to its vision for Oosterwold in 2011. 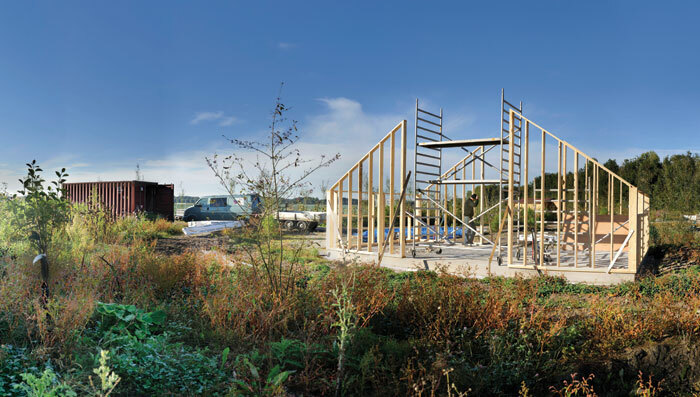 The idea was simple: within the 43ha of the development, people had large amounts of freedom to build and live on their plots as they chose, with just a few caveats. Their actions shouldn’t harm others, and they had to find their own ways to meet their energy, water, sewage and public-space needs. The plan made minimal provision for access, stipulating that a 2m strip around the edge of every plot should be reserved for road, so that everyone would be able to reach their own land. 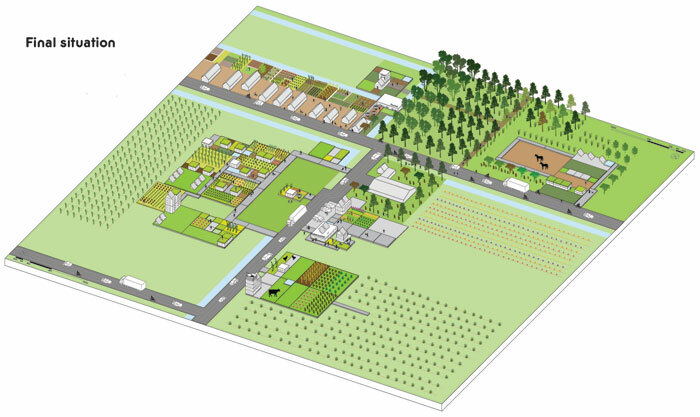 Finally, a specific ratio of different land uses should be maintained, in order to preserve the area’s green, agricultural character: 8% of the land would be roads; 18% buildings; 13% public greenery; 2% water; and 59% given over to urban agriculture. The Oosterwold concept emerged from MVRDV’s early work in Almere, developing a vision for what the city should be like in 2030. It had highlighted strong links to Amsterdam, densification and diversity of housing stock, programmatic mix and landscapes as priorities. The city had begun to experiment with selling individual plots on which people could build their own houses, but the creation of a whole neighbourhood by its prospective residents was a big step up. As MVRDV worked out the rules that would guide Oosterwold, it tested them extensively with drawings and diagrams. Then Almere municipality engaged a game developer, Play the City. ‘The game was basically to test the rules — if you have a plan that has these rules what sort of outcome would it come up with?’ said Ekim Tan, Play the City founder. The organisation had grown out of her PhD research at the Technical University in Delft. It had initially focused on emergence, the phenomenon by which individual agents following simple rules can produce organised patterns of behaviour; but she switched to looking at how game design could enable people to participate in shaping urban developments. In the game process developed during her PhD and subsequently, Tan uses an urban scale 1:300 map of the place in question and blocks representing the various building possibilities, which served as the centre for a discussion. ‘Everybody comes up with their own agenda, but because of the negotiations and all the conflicts and all the things that were happening in that process, they were coming with a very coherent outcome in the end.’ What starts out as a very individualised process, quickly becomes a collective one. 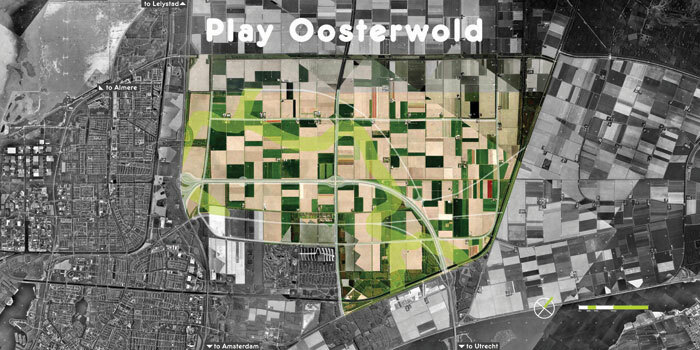 The game that Play the City developed for Oosterwold was installed in an empty shop in Almere as part of the International Architecture Biennale Rotterdam, and some 1,000 people came to play, from local residents and exhibition visitors, to local farmers and the national water board. Mark Schmeink, a legal adviser from Almere responsible for the plan’s legal aspects, became a regular player, using the outcomes to refine his own guidelines. Seeing that people wanted to build close to the water, he amended the rule requiring the 2m access strip to be maintained around the plot, so that it was no longer necessary on the side with, say, a stream running along it. For other regulatory organisations, things were more challenging. It was during the game sessions that the water board, charged with coordinating water levels across the country and preventing flooding, fully understood the plan’s implications and the intention that water drainage would be handled on an individual, plot-by-plot basis. This is a troubling proposition in a country below sea level, which relies on a finely tuned and carefully managed water system. MVRDV had anticipated this and had researched the legal requirements for the development. It is possible, though not common, for water to be dealt with by individual landowners within the boundaries of their plot. 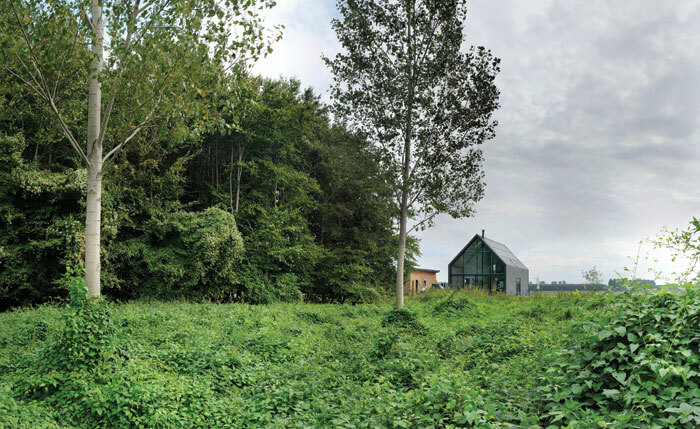 On Frank Meijers’ land, an area has been set aside for water retention, while a soak away behind the house absorbs the household’s grey and black water, where it is treated, before being released into the surrounding landscape. It’s a new way of working for the local government. ‘You really have to let it go... sit on your hands and let them do the work of “How am I going to store my water?”’ says Ivonne de Nood, the area manager for Oosterwold. Though naturally cautious, the water board was willing to rethink how it worked to accommodate the individualised vision of Oosterwold. Instead of setting rules that must be followed, it set goals that residents needed to meet, and which they could do in ways of their own choosing. ‘It works because of the extremely low planned density there,’ notes Jeroen Zuidgeest, head of MVRDV’s strategic planning department. The wider infrastructure of drainage channels and pumps was already there to support 15,000 houses. In a denser neighbourhood, drainage would need to be collectively planned and more strictly controlled, but in Oosterwold’s relatively sparse, green landscape, the regulators could afford to be a little more lax. When MVRDV first presented this vision to its architectural and urban planning peers at the 2012 Venice Architecture Biennale, they were less than impressed. Europeans viewed it as radical, to the point of insanity, while Latin American colleagues found it pointless, seeing parallels with the lack of control over development they suffered from in their own countries. These criticisms perhaps misunderstood the wider context of Oosterwold, one that a quick glance at a large-scale plan of the area makes immediately clear. This is a drastic break from the tightly gridded polder landscape of Flevoland. The restrictive nature of Dutch planning was an obvious source of frustration at MVRDV. ‘If you look at the highly technocratic approach by the infrastructural planners, it’s just completely blocking any discussion of alternatives, or prioritising — maybe that’s even more important — prioritising other values in planning… it was always cars first.’ Rather than fully planned or unplanned, ‘we’re testing this grey area in between, which is the interesting part’, says Zuidgeest. This has also led the local government to rethink how it works. It needs two staff working almost full time to deal with the questions of the hundred or so actively building residents, rather than the single project developer they would typically deal with. ‘How do you support people in the process, in communication, without taking things over, really leaving things to them?’ asks de Nood. This has been a delicate balance. The main thing forcing the residents into contact is the road system, which they have to plan, build and maintain themselves, ensuring access to each plot both for residents and for emergency vehicles. While people can accept a road down one side of their plot, they are reluctant to have a road along two or more sides, though that is quickly becoming necessary, as more plots are sold and developed. ‘Everyone wants to live at the end of a dead end [street],’ says Meijers, so that the first plots to be sold were distributed around the edges of the available land. This is leading to a relatively inefficient and, by extension, expensive road layout, without the connections and places for vehicles to turn that you might expect. Large trucks regularly visit Oosterwold to bring building supplies. ‘Most of the trucks have to go in reverse all the way until they’re on the main road, and then they can turn, but they can’t turn here,’ says Meijers, slightly exasperated. Zuidgeest isn’t too concerned. The residents still need to meet planning regulations around emergency access, for example and, as regards the inefficiency, he points out that more freedom means less control in other ways. Meanwhile the municipality now insists that new plot owners join the sort of residents’ association that oversees the roads, to ensure that everyone is involved and plays their part. 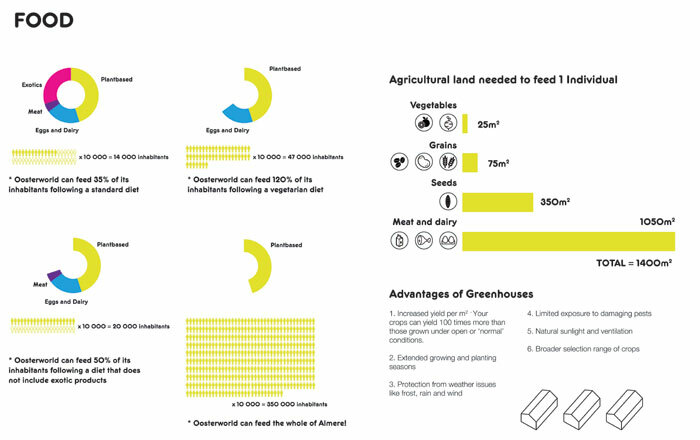 If the road network seems to point to the limits of Freeland’s self-organisation, where people have no choice but to work together, then perhaps the more voluntary collaboration around the urban agriculture indicates its possibility. Neighbours come to help with Meijers’ already established allotment, while he is lending out his tractor and other machinery to help prepare others’ land and sow the first crops. Together they are starting to set up a crop-rotation system across the neighbourhood. Meijers grew potatoes last year; this year someone else will do those as a way to maintain the nutrients in the soil. 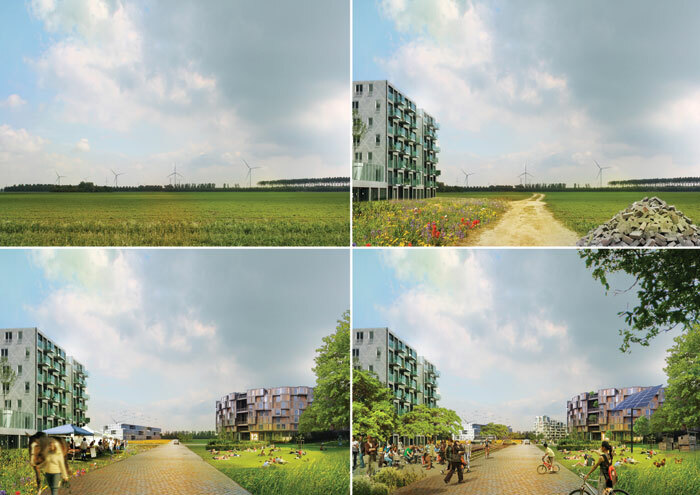 Surprising as the outcomes are, much of this had already been predicted by Play the City in its game simulations and fed back as recommendations to Almere. It had found that players had been adventurous in the ways of living they proposed and gravitated towards autarchic models. They wanted to be largely unreliant on neighbours or wider shared infrastructure because of the responsibilities for meeting their own needs that the plan’s rules imposed. Planning shared infrastructure was a more complex process. Players initially spread their plots out in an inefficient manner, before replanning their neighbourhood to cluster programmes and make the road system, for example, more efficient. It is easier to remodel things in this way in a game than in real life. Play the City cautioned that an area manager would be needed to facilitate this and promote development in the public interest. In all this, the game was remarkably prescient.